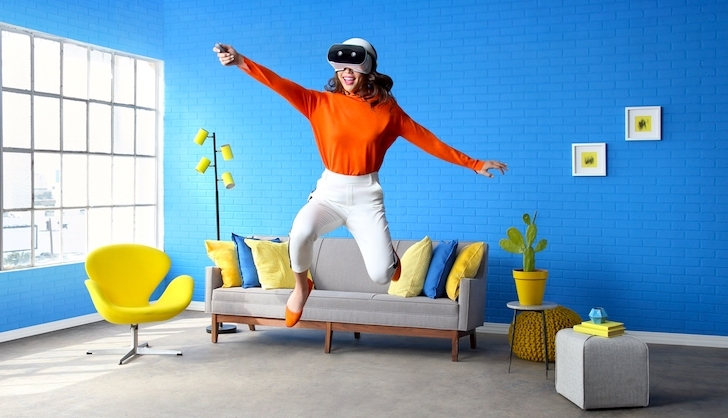 The new headset, manufactured by Lenovo, is the Mirage Solo with Daydream, the first Daydream headset that works all on its own without the need to dock a smartphone. The Mirage Solo takes advantage of Google's WorldSense motion tracking technology that Google characterizes as "PC-quality," able to sense when a user does things like crouch, dodge, lean, take a step in any direction, or just tilt their head. The headset runs on a Qualcomm Snapdragon 835 and 4GB of RAM, so it's in line with at least 2017's flagship phones, and Lenovo claims it lasts up to seven hours on a charge. Neither Google nor Lenovo have announced the resolution of the headset's display, though Qualcomm's chip supports up to 1440p, like what you'd find in a phone with a quad-HD display. The companies are also touting the comfort and ergonomics of the Mirage Solo, with "breathable, insulated contoured padding" for all the areas that come in contact with a user's face and head, and packaging a wireless Daydream controller in the box. But for Mirage Solo users to enjoy all this content they're going to create, they need something to create it with. Lenovo's own offering is the Mirage Camera, and Yi Technology brings the Yi Horizon VR180, both of which were designed in concert with Google. While there are differences in specs for each device, the gist is the same: Google wants consumers to think of their VR cameras just like they do a traditional point-and-shoot, except instead of only still photos, they can capture 3D video and images. Lenovo specifies that it uses dual 13MP fisheye cameras with a 180 x 180-degree field of view, so there's no need to worry about the photographer's head appearing in the image. Both cameras connect right to user's Google and YouTube accounts for live broadcasting, and each can capture photos and video in 4K resolution, with the Yi Horizon boasting a resolution up to 5.7K. In a blog post about the company's VR efforts, Google's VP for Virtual and Augmented Reality, Clay Bavor, says these cameras "are simple and designed for anyone to use," though a lot of that will rest on how much these devices wind up costing consumers, and no prices have been announced. But in the meantime, Google is running a contest in which would-be VR videographers can submit a story idea concerning "a special memory you want to capture to relive or share with those you love." Winners will get to work with Google to bring that idea to life with VR180. Bavor muses in another post that these cameras "do your memories justice, by enabling you to capture life the way you see it—with two eyes." Your two eyes will get to try Lenovo's devices in the second quarter of this year. The Yi Horizon's availability is somewhere over the, ahem, horizon, but no timeframe has been specified.